This is a video I shot at my house with my good friend Siemy Di. We didn’t prepare anything, we just turned on the camera and jammed. I’m using my fretless Warwick Thumb SC and a loop pedal. Siemy Di and I have worked together since 2006 and we have a fantastic musical relationship. We were introduced when I was in my early twenties by a mentor, Lucky Ranku, leader of the African Jazz All-stars. In the video I’m using my 6-string Warwick Thumb SC and I’m playing it through a loop pedal. The piece is entirely improvised on the spot. 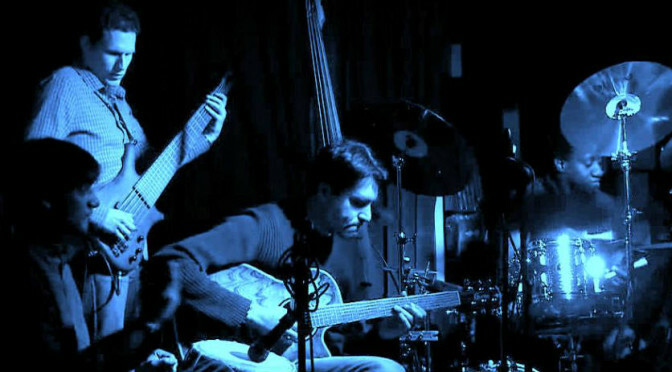 Around the time this was filmed, Siemy Di and I were performing live regularly around East London at venues such as The Servant Jazz Quarters, The Vortex, Open The Gate and The Passing Clouds. The gigs were almost entirely improvised and we deliberately did very little preparation for each gig. Some performances were better than others but it was always great fun to play with a great musician like Siemy. This video captures a little taste of what those performances were like. Not perfect but always interesting. Siemy Di and I are still close friends but we don’t do those gigs anymore. We both have young children now, so spending our evenings at jazz clubs is out of the question these days. Maybe one day in the future we’ll do something similar, although I imagine it will be quite different. This video captures a moment in time that was an important time for both musicians. Check out Siemy Di’s Drumeo video here. I recorded all the bass and guitar parts for both the first and last pieces. In this video, I’ll demonstrate my fretless Warwick Thumb Single Cut 6-string bass guitar. I’m playing one of my own compositions and the bass is being played through my Warwick Hellborg Amplifier rig, including the Hellborg preamp. I’m a jazz musician at heart, so I love fretless bass guitars. My Warwick Thumb SC is now the only fretless bass I own, for the simple reason that it’s so good there was no point in keeping any of the others I’d owned previously. 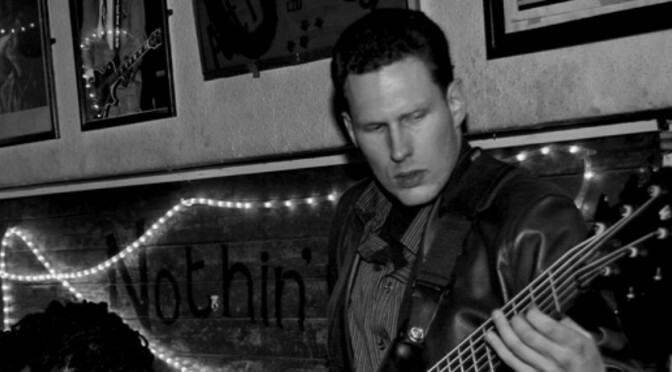 I owned two fretless basses before I purchased my Thumb SC and I sold them both on eBay within months of it arriving. The tone of the bass is absolutely beautiful and the build quality and the quality of the wood are second to none. The body is made from Swamp Ash with a one inch Bubinga Pommele top. The neck is Flamed Maple and the fingerboard is Tigerstripe Ebony, which is a very hard wood, so even round wound strings won’t chew up the fingerboard. It features full line inlays on the fretboard which is a custom shop option. All Warwick’s custom shop basses have their own page on their website. You can see mine by clicking on this link. In my opinion, all fretless bass guitars should come with fret lines. I’ve never met anyone who has perfect intonation without them. Really no one, and I’ve met many of the worlds best bassists. So, choosing not to have lines is just macho nonsense, there is no benefit to not having the lines. Jaco Pastorius had fret lines on his bass. I’ve heard many people say, “double bass players don’t need lines on their fingerboards”. I know, and it’s not relevant because bass guitar necks are nothing like double bass necks. 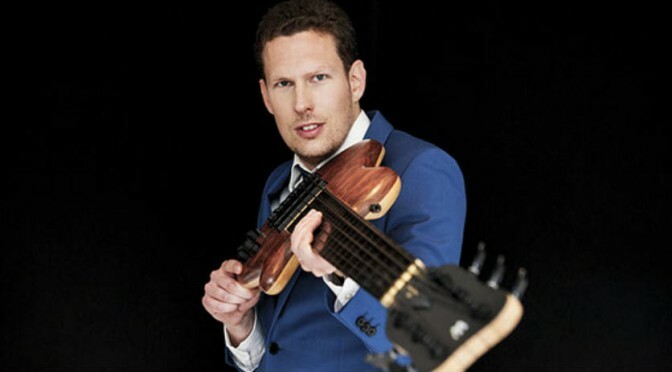 There are much more notes in a smaller space on a bass guitar neck which makes them almost impossible to hit accurately at high speed without markers. Also, double bass necks start narrow and get wider, so it’s much easier to feel where you are on the neck than it is on bass guitar. The Warwick Thumb SC is quite simply the best fretless bass I’ve ever played. 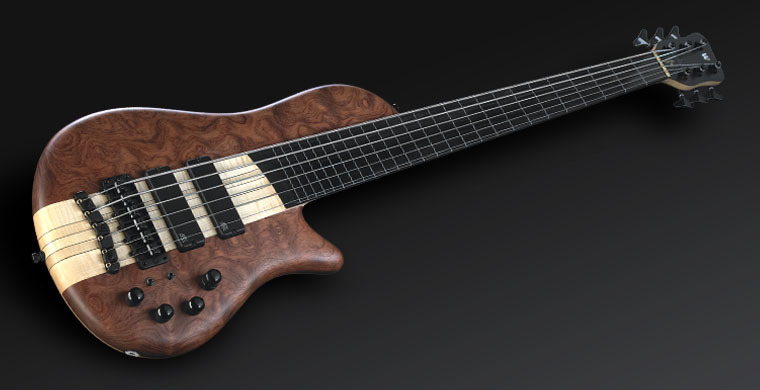 In fact it’s the best bass I’ve ever played and that includes Fodera’s. It’s not cheap, but you get what you pay for. Don’t forget, if you want to go fretless, get the full line inlays. In this video lesson, I’ll teach you the best and most efficient techniques for your left hand on the bass. I’ll explain the one finger per fret technique and how you can extend the range even further by changing how you use your left hand index finger. For me practicing techniques is all about learning to play in the most efficient way possible. Whether I’m working on my left or right hand technique, I’m always trying to find the simplest way to play the notes that involves the least amount of movement in my hands. As far as I’m concerned all unnecessary movement slows me down. For my left hand I like to use the “one finger per fret” system. You can practise and master this technique by using the following exercise. Spend some time working on the above examples until you get used to the “one finger per fret” system. Once you get used to the system, use it to practice some scales and arpeggios. They’re great for mastering left hand techniques. 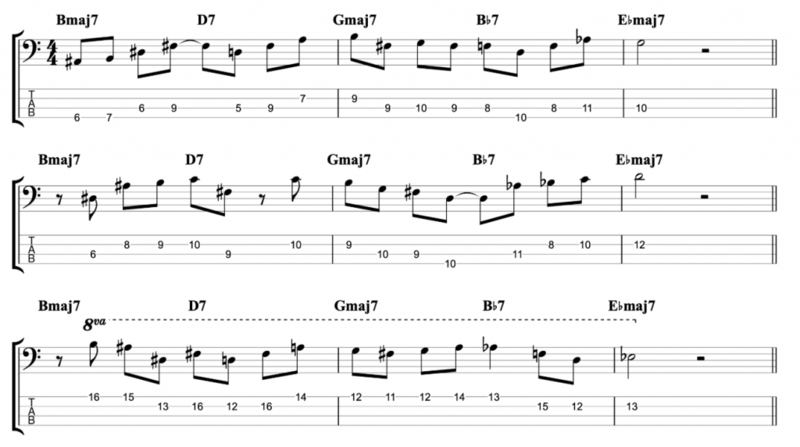 The following examples are just a few scales and arpeggios you can use. If you want to take your left hand technique a step further then there is another thing you can do. As you get further up the neck of the bass the frets get closer together. Which means that the stretches needed to play “one finger per fret” get smaller. It occurred to me that I shouldn’t restrict myself to “one finger per fret” in areas of the fingerboard where my finger span could be much greater than 4 frets. So when I get above the 5th fret of the bass I use my 1st finger to cover 2 different frets while my 2nd, 3rd & 4th fingers still play “one finger per fret”. This allows me to cover 5 frets in a single position. Which gives me access to the entire chromatic scale without having to change position. Example 9 demonstrates how I play a Eb major scale starting on the 6th fret of the A string. In this case my 1st finger can play the 6th or 7th frets. My 2nd finger plays the 8th fret, my 3rd finger the 9th fret and my 4th finger the 10th fret. If you’d like to improve your right hand technique as well then check out this video lesson. Improve Your Right Hand Technique on Bass Guitar. In Part 4 we’re going to look at chord extensions. 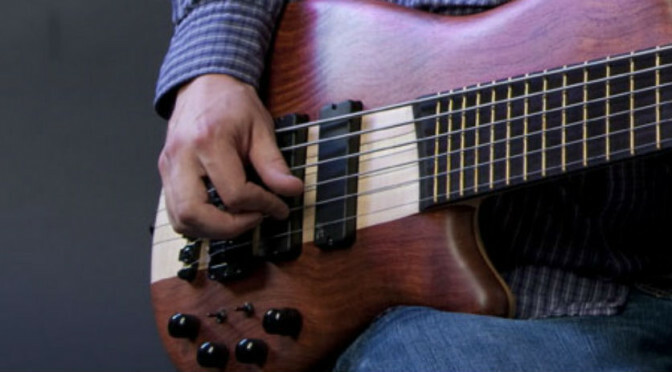 In this video lesson you’re going to learn how to play chords with chord extensions on the bass. I’ll also explain what notes you can leave out and why, in order to make your chords sound more interesting. Extended harmony is where chords get a lot more interesting sounding but it’s also where the theory gets more complicated. 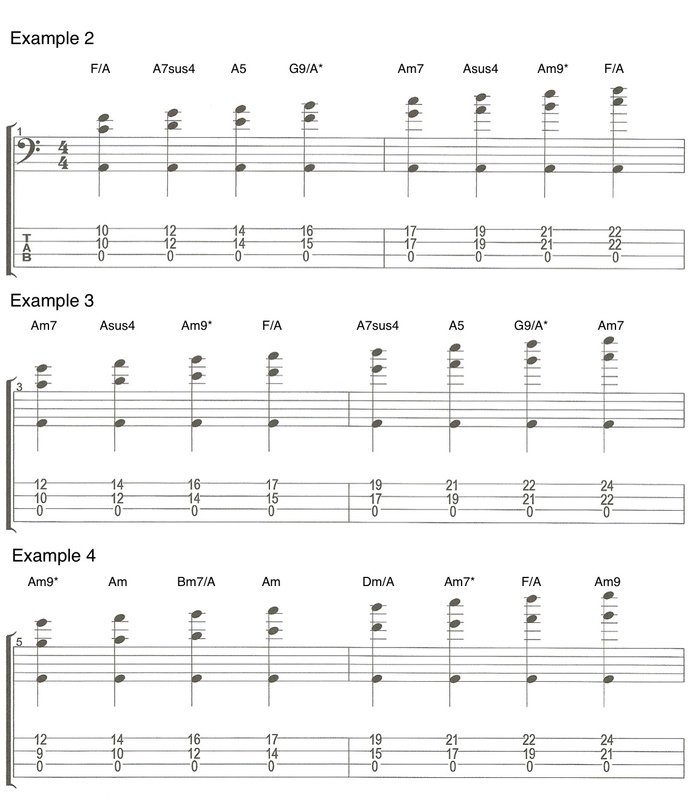 Chord extensions are notes that we can add to basic chords like triads. Having established how to play triads in Part 3, we can now look at adding chord extensions to them. The most common chord extension by far is the seventh. In Part 3 we looked at how triads are made up of a root, a third and a fifth. And there is an interval of a third between each of these notes. In order to make a triad into a seventh chord we just continue this pattern of stacking intervals of a third. We add a note that is a third above the fifth and we call this note the seventh. Seventh chords have four notes in them root, third, fifth and seventh. If you watched my video about “Intervals” then you’ll know that there are two types of sevenths, major and minor just like there are major and minor thirds. Fifths however are not major or minor and so the fifth is the same in both major and minor chords. For this reason, it’s the third and seventh notes of each chord that define what type of chord it is. For example if you have a chord with a major third and a major seventh in it, it’s called a major seventh chord and a chord with a minor third and a minor seventh is called a minor seventh chord. The word used to describe a chord that has a major third and a minor seventh in it is “dominant” and dominant seventh chords are very common. These three types of seventh chords are by far the most common but there are others that I’ve also listed at the end of Example 1. For example, a chord with a minor third and a major seventh is called minor with a major seventh (min/maj7). What notes can you leave out? When we play extended chords we usually can’t play all the notes within the chord because we only have a finite number of strings on the bass. 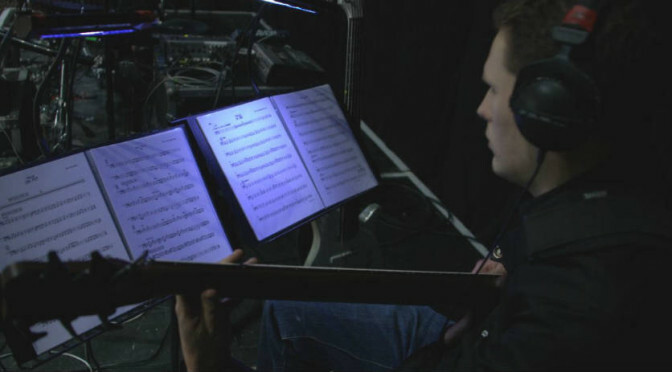 The more chord extensions we have means the more options we have, but it also means the more decisions we have to make in terms of what notes to leave out. In the case of seventh chords the decision is simple, I’ve already mentioned that the fifth is the same for major and minor chords so the fifth doesn’t fulfill a very important function in the chord (unless we alter it as in diminished and augmented chords). So if we leave out the fifth we have three notes left, the root, third and seventh. Example 1 demonstrates two different ways of voicing major seventh, dominant seventh, minor seventh and minor with a major seventh chords. The first way is to play the root on the A string, the third on the D string and the seventh on the G string. The second way is to play the root on the E string, leave out the A string and play the seventh on the D string and the third up an octave on the G string. Just because the fifth is the same for both major and minor chords doesn’t mean we can’t alter it. You can flatten the fifth (lower by a semi-tone) to give you a diminished chord or sharpen it (raise it by a semi-tone) to give you an augmented chord. In order to play a diminished or augmented chord you need to include the fifth because the fact that it’s been altered makes it a key element in the chord. That is why I have included all four notes in the augmented and diminished examples in Example 1. Another common chord extension that we can use instead of a seventh is a major sixth. We can add a major sixth to a major triad or a minor triad. The chord symbol for a major chord with a major sixth is just the number 6 (eg. G6, A6, C6 etc.) and the chord symbol for a minor chord with a major sixth is m6 (eg. Gm6, Am6, Cm6 etc.) Example 2 demonstrates how to play these two types of chords. Again, I’ve left out the fifth in both cases. If we harmonise any major scale into seventh chords we get seven different chords, two major seventh chords (chords I & IV, three minor seventh chords (chords II,III & VI), one dominant seventh chord (chord V) and one half-diminished chord (a chord with a minor third, a minor seventh and a flattened fifth) (chord VII). In example 3 I’ve harmonised a D major scale into seventh chords. After the seventh, the next extension we can add to a chord if we keep stacking intervals of a third is a ninth. A full ninth chord has five notes in it, root, third, fifth, seventh and ninth. Example 4, demonstrates how to play a few common ninth chords by adding a ninth to a major seventh chord, a dominant seventh chord, a minor seventh chord and even a major sixth chord. As before I’m leaving out the fifth in each chord. If we keep up this idea of stacking intervals of a third we end up with an eleventh and then a thirteenth. By the time you reach the thirteenth you have seven notes. Most scales have seven notes. So a seven note chord would effectively be equivalent to playing all the notes from a scale simultaneously. Which is usually a bad idea. Also, you can alter (either sharpen or flatten) the upper extensions (ninth, eleventh and thirteenth). Just like I altered the fifth earlier. This gives you a huge amount of options in terms of extending chords. So, we have to exercise some judgement over which chord extensions we can add to which chords. And that all comes down to what we think sounds good. For example, you normally wouldn’t want to add an eleventh to a chord with a major third in it (major or dominant). Because the eleventh clashes with the third but you can add a sharpened eleventh. If you want to add an eleventh to a major chord then you would normally leave out the third. That would change the chord to what we call a “sus” chord. A sus chord is a chord that omits the third and usually replaces it with the fourth. The fourth is the same note as the eleventh. Check out my video on “intervals” if you don’t understand why the fourth and the eleventh are the same note. Example 5 demonstrates some common chord extensions that we can play over major or minor chords on the bass. For Example 6 I’ve had to switch onto my six string bass to play some of these extensions. The ability to play more extended harmony is one of the main reasons I choose to play six string basses. If you don’t have a six string bass, many of these chords can be adapted onto a five string bass. In this video lesson you’ll learn how to play triads on bass guitar. There are four different types of triad. I’ll explain what they are and then how to play them. Triads, what are they and how do you play them? In part 3 we’re going to look at how to play triads on the bass. They are simple three note chords that form a foundation for a lot of extended harmony. Before we can go on to explore chord extensions it’s really important to understand triads. There are essentially four types of triad. Major, minor, diminished and augmented. So, example 1 contains an example of each triad. In this example they all have the root note C.
Of these four, major and minor are by far the most common and will be the ones we use the most. We can harmonise scales into triads. In part one we harmonised scales into intervals of a third. A triad is two intervals of a third stacked together. By which I mean, you take a root note, find a note that is a third above it and then another note which is a third above again. The three notes of a triad are often referred to as the root, the third(an interval of a third above the root) and the fifth (an interval of a third above the third and an interval of a fifth above the root). You’ll find that when you harmonise a major scale into triads you’ll get seven chords, three major (chords I, IV & V), three minor (chords II, III and VI) and one diminished triad (chord VII). In example 2 there’s a G major scale harmonised into triads played in root position. Meaning that the root note is the lowest of the three notes. In the previous example we refer to these chords as root position because we’ve arranged each triad in a neatly stacked order with the root at the bottom and the third and the fifth stacked on top of it. If we change the order of these notes to make either the third or the fifth the lowest note then we have what we call an “Inversion”. There are only two possible ways to invert a triad. First of all put the third at the bottom as in Example 3. Then put the fifth at the bottom as in Example 4. 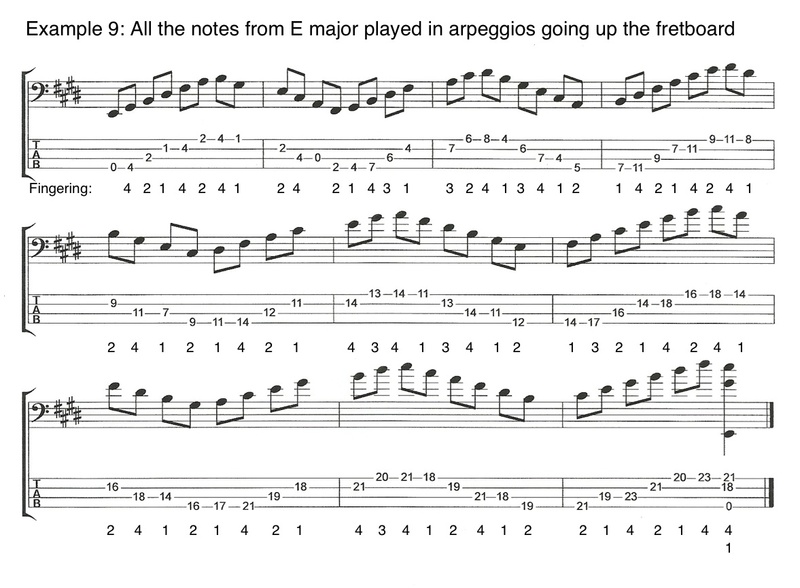 Example 5 is an E major scale harmonised in first inversion triads. Finally example 6 is a D major scale harmonised using the second inversion. If you harmonise a melodic minor scale into triads you get two minor chords, two major chords, two diminished chords and one augmented triad. So, in example 7 there’s a G melodic minor scale harmonised using root position triads. Now move on to Playing Chords on the Bass – Part 4 – Chord Extensions. You’ll learn how we can add extensions to the triads so you can make more interesting sounding chords. As I was posting some of my previous videos I started thinking that I should add a new one describing some of the right hand techniques you’ve seen me using, so here it is. When I was learning to play I was taught to place the thumb of my right hand on either a pickup or on the bottom string. Then pluck the strings with my index and middle fingers. It’s a very common right hand technique for the bass and one that I still use a lot. The downside of this technique in my opinion is that it doesn’t make enough use of the thumb. The thumb is probably our most versatile and dextrous digit, so some time ago I decided that my two finger technique wasn’t versatile enough for everything I wanted to play on the bass and I started working on some right-hand techniques that use my thumb more. 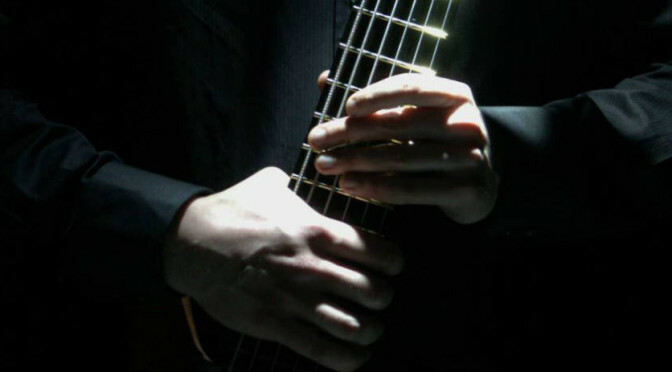 A simple way to use your thumb with the two finger right hand technique is to use it to dampen and mute the lower strings. Damping is a key issue for bass players especially with the lower strings because they have a tendency to ring and create unwanted noise when we’re not using them. If you position your thumb so that it touches these strings when you’re not using them it will mute them and stop any unwanted noise coming from them. This is a simple adaptation to the technique that can make an important difference to your playing, especially if you have a low B string on your bass. It will involve some practice because you will need to get used to constantly moving your thumb as you change strings but if you’re conscientious about listening out for unwanted noise from your lower strings when you practice then it should become instinctive fairly quickly. Now let’s change the technique altogether and get our thumb playing notes instead of just damping. The first thing we need to look at is how can we combine using our fingers and thumb. Example 1 is a simple demonstration of how we can play notes by alternating between our thumb and first finger. In the example T means play the note with your right hand thumb and i means play the note with your right hand index finger. As you can see from the example we should be able to use this technique to play across strings as in bar one, on adjacent strings as in bar two and on the same string as in bar three. The advantage of this right hand technique over the two finger technique is that it’s much easier to play across strings. There’s much more independence (and physical distance) between your index finger and thumb between your index and middle fingers. I also find it much more natural to keep a constant tempo at high speeds. A third benefit of using this right hand technique is damping, particularly palm-muting. When I use this right hand technique I rest the palm of my hand on the lower strings near the bridge to dampen them and stop any unwanted noise. In effect my palm is functioning in the same role my thumb was in the previous right hand technique. I can take this technique a step further and use my palm to mute the strings I’m playing as well. If you rest your palm on the string close enough to the bridge then you’ll still hear the note. However, it will have a muted and staccato sound. It’s a good approximation to the classic Motown sound that James Jameson used to get by putting bits of foam under his strings in front of the bridge. Anthony Jackson is another great bass player who uses this muted sound a lot in his playing. Try playing through Example 1 both with and without the palm muting. Then when you get used to it, try applying the same techniques to other areas of your practice. You can also add your third finger (and even your little finger) to this technique especially if you’re playing chords that use more than just three strings. Again this is similar to how a guitarist would finger pick. Another simple right hand technique you can apply to playing chords is raking. With either your index or middle finger or both. Example 3 is a demonstration of this right hand technique. You might think that the next logical place to take our right hand technique would be to try and use our thumb and three fingers and then our thumb and four fingers. And you might well be right. A lot of bass players have explored right hand techniques using all the fingers on their right hand. And I would encourage you to explore it, as I have, to find out what works best for you. My personal favourite right hand technique is a little simpler. I prefer to use my thumb with my index and third finger. It sounds a little odd because I’m not using my middle finger. However, after years of experimenting with three and four finger right hand techniques. I’ve found this one to be the most efficient for me. I think it’s because my index and third fingers are almost the same length whereas my middle finger is longer. When I try and use those three fingers all together, it works, but it’s less comfortable than when I leave the middle finger out. This right hand technique has proved very versatile. It’s fast, it’s easy to cross strings. It’s easy to keep a constant rhythm even at high speeds without getting tired. And it works well for both triplet and sixteenth note rhythms. Once you’ve found a technique, or several techniques that work well for you then try applying them in all areas of your practice. For instance, Example 5 is a demonstration of how I might apply my technique demonstrated in Example 4 to practicing a C major scale. What Are Intervals and How Do You Play Them On a Bass? The word “interval” describes the distance (in terms of pitch) between two musical notes. The smallest interval on the fretboard is a semi-tone. It’s the distance between any note and a note that is one fret above or below on the same string. There are 12 notes in an octave which means there are 12 semi-tone intervals. If we play these 12 semi-tone intervals one after the other then we are playing the “Chromatic Scale”. This isn’t a very interesting sounding scale but it’s really important to understand the chromatic scale if we’re going to understand intervals. Because there are 12 semi-tones in an octave, it is possible to play 12 different intervals within an octave (including the interval of an octave itself). Here is a list of all 12 intervals (plus 4 more intervals that are larger than an octave) along with tab showing how to play them on the bass. The interval called a “tone” is equal to two semi-tones or you can think of it as the distance of two frets on a single string. Tones and semi-tones can also be called whole-tones and half-tones and also whole-steps and half-steps. An interval of three semi-tones is a minor 3rd and four semi-tones is a major 3rd. Check out Playing Chords on the Bass – Part 1 where I show you how to make chords by using intervals of major and minor 3rd’s to harmonise scales. Five semi-tones gives us an interval of a 4th. A 4th is neither major nor minor. This interval is often described as a perfect 4th. Six semi-tones gives us an interval called a sharpened 4th because it’s one semi-tone bigger than a 4th. The same interval can be called a flattened 5th because it’s one semi-tone smaller than a 5th. It’s also sometimes called a tri-tone because six semi-tones is equal to three tones. Seven semi-tones makes a 5th or a perfect 5th. Eight semi-tones creates a minor 6th and nine semi-tones, a major sixth. Check out Playing Chords on the Bass – Part 2 where I use intervals of 4th’s, 5th’s and 6th’s to harmonise scales. In this second part in my series of videos about playing chords on the bass, we’re going to continue looking at how we can make chords by playing double stops (two notes played at the same time) over open strings. In Part 1 we harmonised scales into intervals of a third and in Part 2 we’re going to see how we can get a whole new set of sounds and chords by changing the interval we use to harmonise our scales. 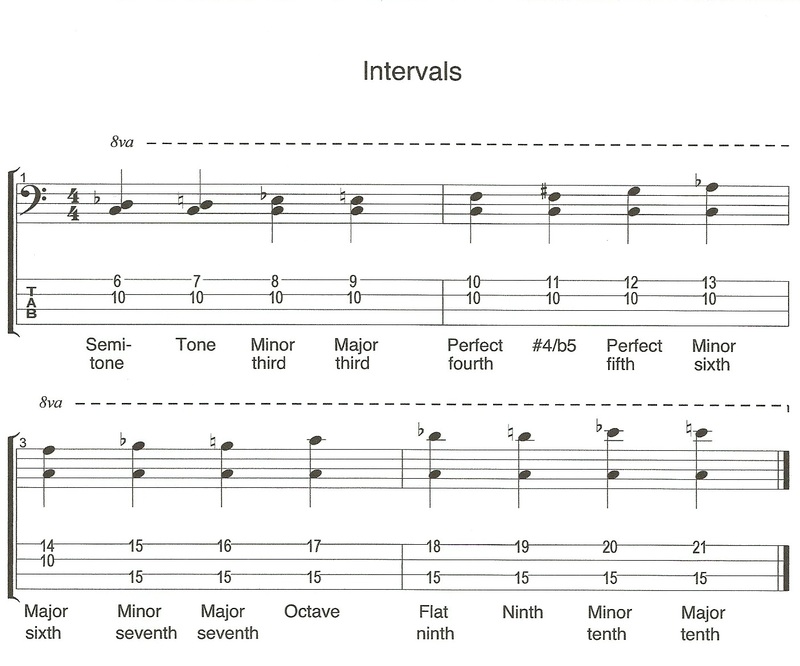 If you’re not sure what an interval is or how we play intervals on the bass then check out my video called Intervals which is also available on this site and it will explain everything. In Example 1 I’m playing a C major scale harmonised into intervals of a fourth. In Example 2 I’m playing the same C major scale played in fourths. I’m playing it over an open A string. Then in the following examples I’m still playing a C major scale over an open A string. However, I’m changing the interval that I’m using to harmonise the scale. In Example 3 I’m harmonising the C major scale in fifths and in Example 4 I’m using sixths. You can hear that each different interval gives us a different sound even though I’m harmonising the same scale over the same note. * I’ve marked some chords * in the above examples because they don’t contain thirds. The Am7 and Am9 chords could also function as A7 and A9 because they don’t contain the note C. Which is the minor 3rd. I’ve labeled them as minor chords because if we were to add a third in this key it would be a minor third C. Not a major third C#. The G9/A chords in Examples 2 & 3 also don’t include the 3rd B but again I’ve labeled them according to what they would be if we added a 3rd in this key. 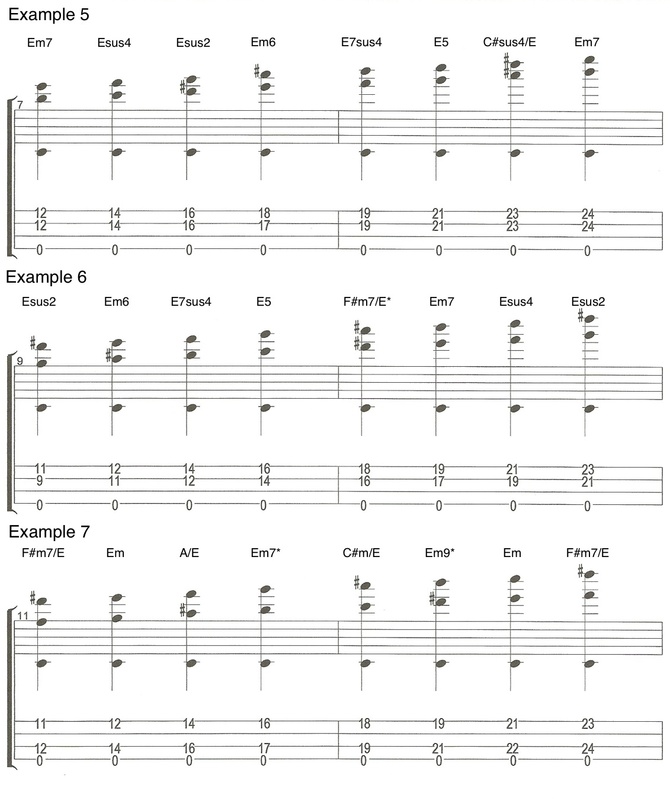 The same is true for the chords marked in the examples below. The next examples are a similar idea. Only this time I’m harmonising a D major scale and playing it over an open E string. This gives us a Dorian sound. In Example 5 I’m harmonising the scale in fourths. In Example 6 I’m using fifths and in Example 7 I’m using sixths. Notice how in Example 7 using the open E string instead of the open A string gives us a different option for fingerings when we play the scale in sixths. We can now play the lower of the 2 notes on the A string. The higher note on the G string while we leave out the D string altogether. These examples are just a small demonstration of some the sounds that you can come up with using this idea. It wouldn’t be impossible to list here all the possible variations you can achieve by harmonising scales over open strings. So, I really want to encourage you to experiment and come up with ideas of your own. Before I leave you, I’m going to share one more idea. Here’s what the A melodic minor scale that I introduced at the end of Part 1 sounds like when you harmonise it in sixths and play it over an open A string. 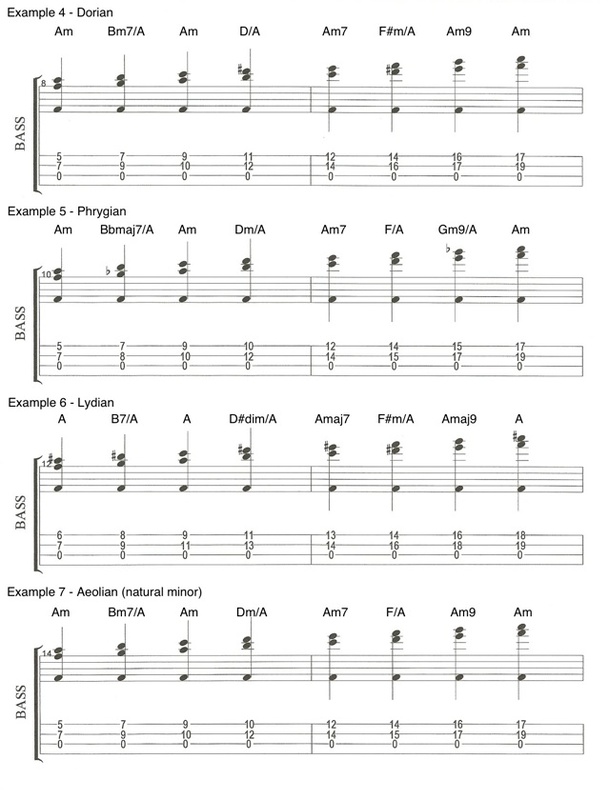 Now move on to Playing Chords on the Bass – Part 3 – Triads. You’ll learn how we can add extensions to the triads so you can make more interesting sounding chords. Can You Play Chords on Bass Guitar? I love the sound of chords played on a bass and I use chords a lot in my playing. 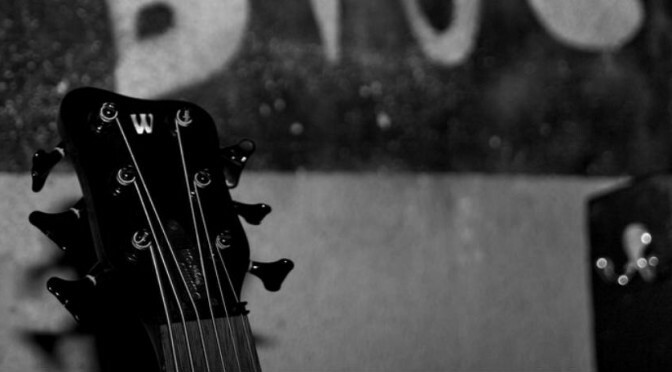 Apart from just sounding great, practicing chords on the bass has many benefits. The main one is that it really helps you to learn harmony on the fretboard. A good place to start is with double stops (playing 2 notes together). In this first example I play an A major scale two notes at a time using intervals of a third. This gives us the foundation of seven different chords. Click on the examples to make them bigger. If you play through my written examples, I would encourage you to not just play them the way they are written, its a ok to start like that but once you feel comfortable with the notes I would recommend changing the order in which you play them as this will help you to experiment and come up with musical ideas of your own. In this second example I play the same notes I played in example 1. However, I also play an open A string with each chord. As you can see from the chord symbols written above the notes, adding this open A string changes some of our double stops into chords. I’ll explain below why I have used these chord symbols. If you don’t want to know the chord theory then please feel free to skip onto the next examples. The first chord is still A major but the second chord becomes an inverted B minor 7 chord because the A is the minor 7th relative to the B while the D played on the 7th fret of the G string is the minor 3rd. The third chord is now A major where before it was C sharp minor. This is because the C sharp played on the 11th fret of the D string is the major 3rd relative to our open A string and the E played on the 9th fret of the G string is now functioning as the 5th. These three notes make a simple A major triad (A, C sharp and E) more commonly just written as A. The fourth chord is now an inversion of a D major chord. It’s also a simple triad because there’s a D on the 12th fret of the D string and an F sharp on the 11th fret of the G string. F sharp is the major 3rd relative to D and the open A sting is the 5th relative to D. So these 3 notes make up a D major triad but it’s an inversion because D is not the lowest note. A is the lowest note, so we call the chord D over A.
I think of the fifth chord as A major seventh even though it doesn’t contain the major 3rd note, C sharp which is normally found in this chord. It does contain the 5th E and the major 7th G sharp. It’s OK to sometimes leave notes out of chords. On the bass, if we are dealing with extended chords (chords with lots of notes) we will have to leave some notes out so in this case the chord can still function as an A major seventh chord even without the C sharp. The sixth chord is still F sharp minor as it was in example 1. Only now we call it F sharp minor over A because the open A string is now the lowest note. The seventh chord I have called A major ninth because the G sharp played on the 18th fret of the D string is the major 7th relative to A. The B played on the 16th fret of the G string is the 9th. Normally in a full A major ninth chord you would have a C sharp (the 3rd) and an E (the 5th), but the chord can still be thought of as A major ninth. If you are struggling to understand all this explanation of the chord symbols don t worry too much. The most important thing is that you learn what they sound like so you can be creative with them. In example 3 I still play the same notes as example 1 only now I play an open E string with each chord. This gives you a different sound to example 2 and changes the chords, they’re now mixolydian. This is basically what you get when you play an A major scale over an E note. Now in the next examples I’ll change things slightly. I’m going to stop using the notes from the A major scale that we worked out in example 1. Instead, in the following examples I’ll use the notes from a G major scale (example 4), F major scale (example 5), E major scale (example 6) and C major scale (example 7), and play each of them with an open A string. 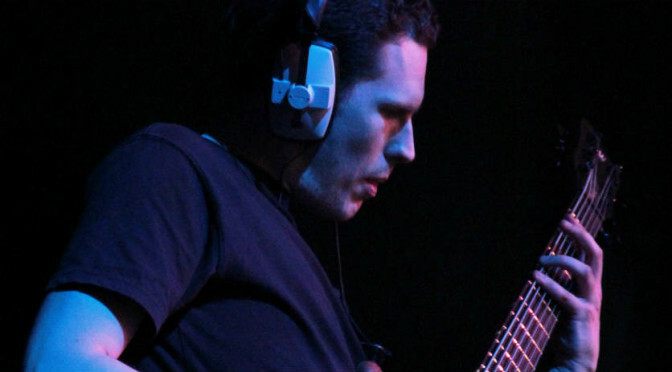 These examples are meant to demonstrate the different sounds you can achieve on your bass by harmonising different major scales over a single bass note. In this case the single note was our open A string. I’ve added the Greek names for the modes (Dorian, Phrygian, Lydian and Aeolian) to the examples above for your reference. The examples are certainly not a complete list of all the modes. I’ve simply presented them here so you can take the idea and experiment to come up with your own ideas. The most important thing, as with everything we practise, is to learn the sounds. Once the sounds are in your head and the notes are under your fingers then you’ve achieved the most important target. Learning the names of the chords and the modes is useful, but not nearly as important as learning the sounds they make. I’ve added one last example here to give you an idea of something slightly different. All my previous examples have used a major scale. In this example I’m using a scale called the melodic minor scale. Try this out and see if you can come up with something interesting. * I’ve labeled the 5th and 7th chords here Amaj7 and Amaj9 because that’s what I’ve called the same chords in previous examples. As I mentioned before, neither chord includes a major 3rd but both chords include the note G sharp which is the major 7th relative to A and so they can both function as an A major chord. It is however important to note that the scale I’m harmonising in exercise 8 is an A melodic minor scale. So, if I add the 3rd to either chord then it’s a minor 3rd, not a major 3rd. Then the full chord would be called A minor with a major seventh. Now move on to Playing Chords on the Bass – Part 2. You’ll learn how we can make chords by using intervals of 4ths, 5ths and 6ths.